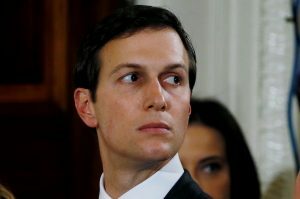 WASHINGTON – Three Senate Democrats are calling on the White House to review and possibly revoke Jared Kushner’s security clearance. They are pointing to the revelation of a meeting with Russian contacts during President Donald Trump’s campaign. Kushner is a senior adviser to Trump and his son-in-law. Along with other Trump officials, he attended a June 2016 meeting with a Russian lobbyist who indicated she had damaging information about Democrat Hillary Clinton. WATCH: What Russians think about Trump and the U.S.
Kushner disclosed the meeting on his security clearance paperwork, but Democrats have questioned how much he disclosed. Blumenthal suggested on Twitter that Kushner’s clearance should be revoked. There is simply no way, knowing what we know, that Kushner can be trusted with our country's secrets.